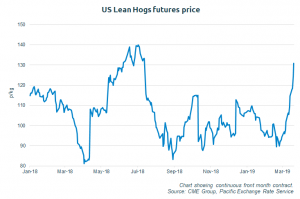 Pig prices in the US have been rallying sharply in the last few weeks, while commentators highlight that there is optimism that the African Swine Fever (ASF) situation in China, will relieve the pressure on an otherwise oversupplied market. 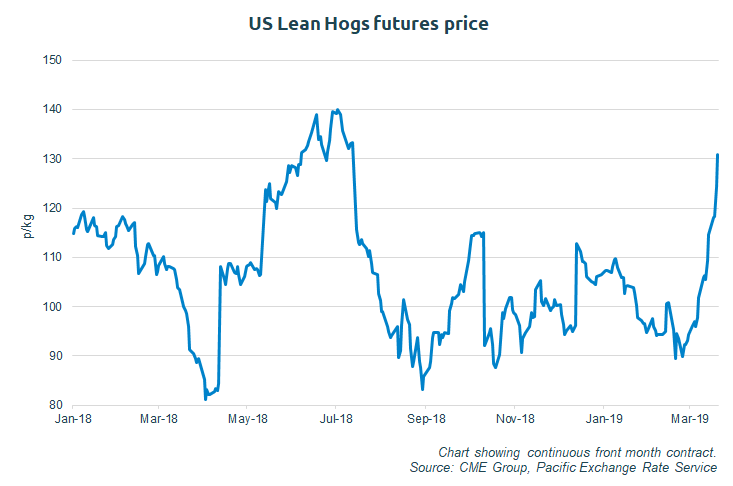 On Friday, March 15, China’s Ministry of Agriculture and Rural Affairs reported its pig herd had fallen by nearly 17% in February compared with the previous year. Within this, the sow herd also reportedly fallen by more than 19%. China, home to the world’s largest pig herd, has reported over 112 outbreaks of ASF in 28 provinces and regions since August 2018. In reality, the number of outbreaks will be much higher than this; some reports suggest 30-50% of Chinese pig farms have been affected. For UK farmers and processors, this combination of events may have a new significance if the country leaves the EU with no-deal. Mr Wyatt added: “We would expect a surge in Chinese imports to boost demand for UK product in any case, but the timing could be particularly useful under a no-deal scenario due to the compromised competitiveness of exports to the EU.